I Just Forgot by Mercer Mayer was published in print in 1988. It is a beloved story about Little Critter as he tackles a challenge every young child must take on ... remembering things for themselves. And he does a great job for a little guy, getting his own breakfast and heading out to the bus on his own. But he still needs his mom to remind him to make his bed, put the milk away, and bring his lunch. By night-time, Little Critter has had a full day of forgetting (and remembering) before the one thing he'd never forget ... his bedtime story! This digital version adds a new twist, having the reader try to find all the little mice (22 in all) and cute spiders (17 in all) hidden on every page. When the child taps on a mouse or spider, a chime sounds; at the end of the book, a page is displayed with the number of mice & spiders (of the total) successfully found. This little extra was a big hit with my kid and made re-reading a bit more fun. As a parent, I liked this interactivity because it rewarded my child for paying attention, although it did distract from the story on the first reading. 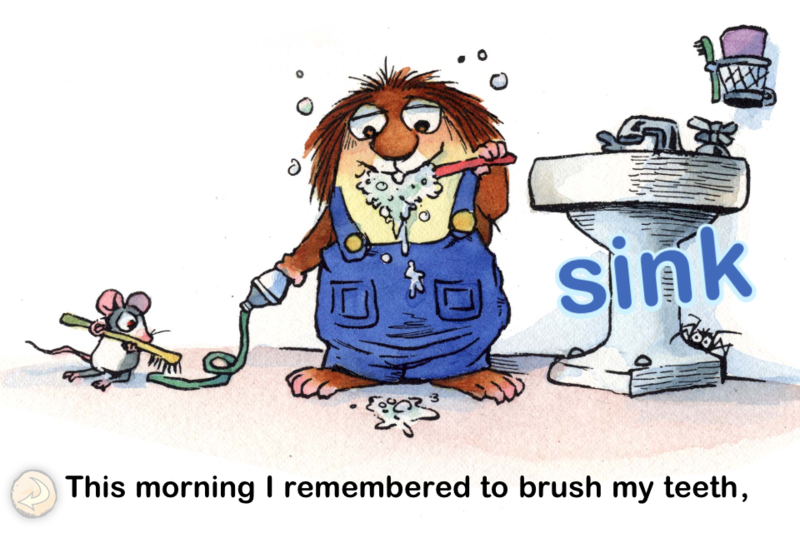 Little Critter remembers lots of things, but sometimes he also forgets ... he remebers to brush his teeth, but forgets to make his bed in the morning, for instance. Then he puts his dishes away after breakfast, but leaves the milk out. Each stage of the day is like this, with some things successfully remembered, but other important things left for his mom to remind him. He gets himself on the school bus, but forgets his lunch ... Mom runs it out to him, of course. After a big day of remembering and forgeting, Little Critter gets ready for bed. He forgets to pick up his toys and turn off the tub (oops, overflowing water!) but he doesn't forget the most important night-time ritual - the bedtime story with Mom.